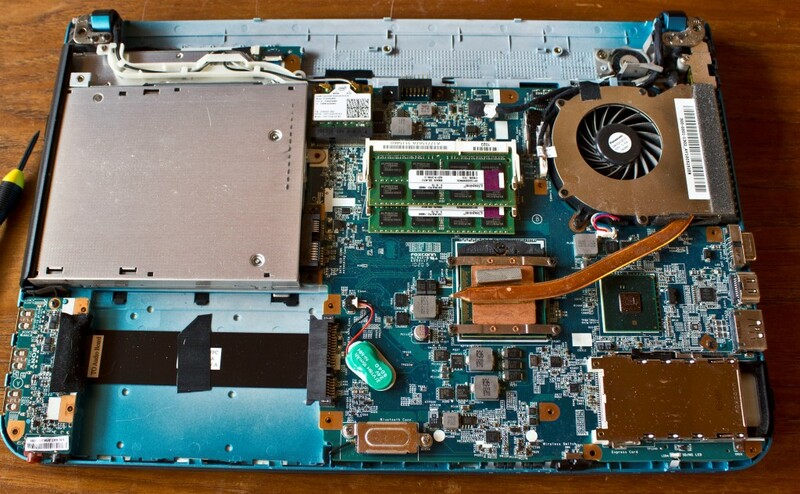 This is a high resolution picture of the laptop insides of a Sony Vaio PCG-61313L. As far as I can tell it looks exactly the same for all Sony Vaio models beginning with the letters “PCG”. I’ll list Sony Vaio PCG model numbers below and you can CTRL+F your model number to see if it’s in the list. Mine is actually not in the list, maybe because it’s a canadian model. I opened this machine up to replace the wifi card, so click the link if you’re interested in reading about that. This was an easy laptop computer to open. First make sure the laptop is unplugged and the battery removed. Unscrew both expansion slots – one holds the ram and the other held the hard drive. You can leave the RAM in but take the hard drive out. Once all screws are removed the bottom cover will come off easily. If you struggle to take it off you probably missed a screw. In my model I took out a total of exactly 19 screws of various sizes. The hard drive was only using 2 out of a total 4 screws. This is a partial list of Sony Vaio PCG Series laptops. If your PCG series motherboard looks significantly different from the one pictured, leave a comment! I would just try to buy an old broken PCG Series, and cross your fingers the screen is compatible. Since there’s so many of these models out there, you’ve got a pretty good chance. But the only way to know for sure if the screen models are compatible would be to open them up before you buy them. Or try to find parts lists. I once fixed a circle saw because I was able to find the exploded parts diagram to see all the pieces, you could try to get your hands on one of those from Sony perhaps?